We bring the best in breast health to you—with same-day results. 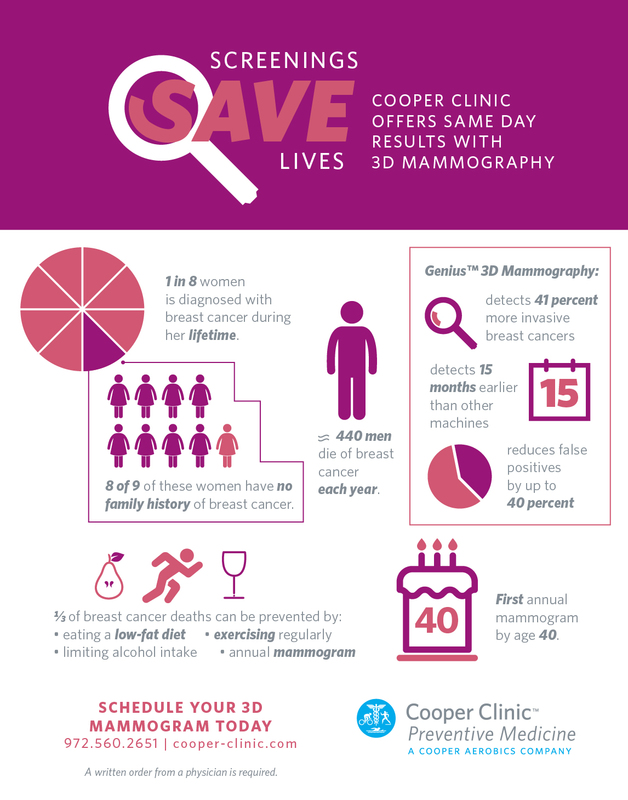 Cooper Clinic offers Genius™ 3D Mammography. At Cooper Clinic we provide women the specialized and comprehensive preventive care you need for breast cancer screening and diagnosis. Getting regular screenings is the best way for women to prevent breast cancer and find breast cancer early, when it's most treatable. Cooper Clinic recommends women begin having an annual mammogram at age 40, but sometimes begins baseline screening for breast cancer at age 35.
Cooper Clinic functions as a diagnostic imaging facility. Our board-certified diagnostic radiologist and breast health subspecialist reviews the screening images, provides same-day results and, based on the patient’s need, can perform a sonogram the same day. Women have peace of mind knowing their personalized results day-of without the anxiety of waiting days or weeks for answers. Hologic® Genius™ 3D Mammography - Different layers in the breast, including blood vessels, milk ducts, fat and ligaments, can be challenging to differentiate when viewed in a 2D traditional mammogram. While the experience is similar to the 2D mammogram, Genius 3D Mammography uses breast tomosynthesis, in which the scan examines the breast one layer at a time by taking multiple photos of each layer. Second Opinion and Evaluation - Our physicians are available to review and provide a second opinion and evaluation for patients with existing mammogram or ultrasound results. Existing Cooper Clinic patients can schedule breast imaging the day of their comprehensive physical exam. If you are not a Cooper Clinic preventive exam patient, you can request an appointment with a written directive from your physician with the results of your most recent mammogram. Call 972.560.2651 for more information. A written order from a physician is required.